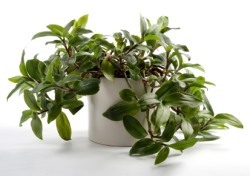 Best known as a hanging plant, the Wandering Jew house plant is easy and fast-growing. Its long, fleshy stems are densely covered with lance-shaped leaves that are about 2 in (5 cm) long. 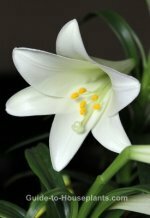 Small, 3-petaled flowers may appear in spring, but they're not showy. A similar plant goes by the same common name: Zebrina pendula has deep green to purple leaves with two broad bands of silver, and purple undersides. It has the same growing habits and requires the same care. To show it off, display your trailing house plant in a plant hanger, decorative plant sconce or on a plant stand. Pinch and prune. Pinch stems back often to encourage branching and to keep the plant from getting too leggy. The best time to prune is in spring and summer, during the growing season. You can easily propagate the stem cuttings for more plants. Pruning tip: Always prune after a leaf node (the place where a leaf is attached to the stem). Cuts made here will cause the stem to branch out for a fuller, bushier plant. Watch for pests. Aphids are small, greenish insects that are attracted to new growth, which this plant has in abundance. Look for them on the stems of new shoots. Also, watch for webbing between stems and on the undersides of leaves, a tell-tale sign of spider mites. Repot in spring, only when the plant outgrows its pot. Move to one just 1-2 inches larger because a pot that's too big will hold too much water. Zebrina pendula is stunning, with shimmering green and purple striped foliage. Several species go by the common name Wandering Jew. Other common names include Inch Plant and Spiderwort. Tradescantia albiflora is one of the most popular. Both 'Variegata' and 'Quicksilver' cultivars have white-striped leaves. Zebrina pendula has beautiful green-and-purple striped foliage, glistening with silver. 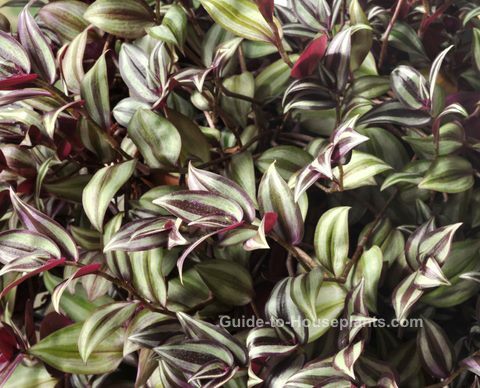 'Quadricolor' has striped leaves in green, silver, purple and pink. Height: Trailing stems can grow to 2 ft (60 cm) or more. Light: Bright, indirect light. Long spaces between leaves are caused by too little light. Pinch off leggy stems and move your plant to a brighter spot. Leaves will also lose their variegation if they don't get enough light. Water: Keep soil evenly moist in the growing season, slightly drier in winter. Stems that look wilted may be a sign of root rot. Cut off any withered stems and allow potting mix to dry out a bit between waterings. Humidity: Try to maintain 40% relative humidity or higher. If leaf tips turn brown, the air is too dry. Increase moisture by using a cool-mist humidifier. Temperature: Average room temperatures 65-75°F/18-24°C suit this tropical year-round. It will tolerate a winter minimum of 55°F/13°C. Soil: Peat moss based mix. Fertilizer: Feed every 2 weeks spring through fall with 10-10-10 liquid fertilizer diluted by half. Too much fertilizer can cause the leaves to lose their variegation. Propagation: Easy to propagate from stem tip cuttings. Take 3 in (7.5 cm) cuttings in spring or summer and place in moist soil. Cuttings will root in about 3 weeks. Moses in the Cradle and Purple Heart Plant are beautiful relatives of this plant family.